Members of news and media organizations are welcome to use the information from our website in articles and stories. 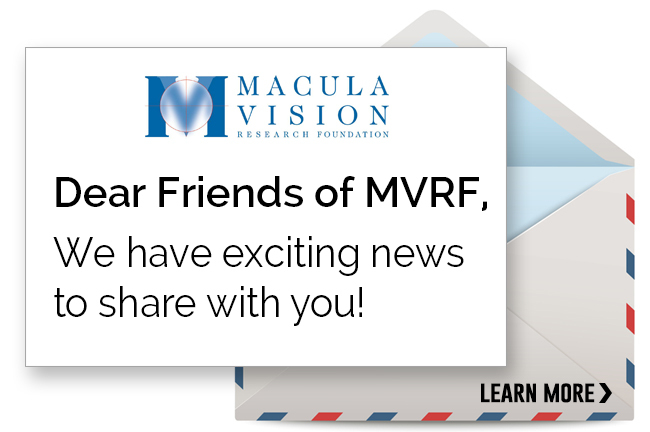 Please cite the Macula Vision Research Foundation (MVRF) and provide our contact information, 1-866-4MACULA, and web address, MVRF.ORG. If you are writing a story about macular degeneration, age-related macular degeneration (AMD), other retina-related diseases of the eye or the important work MVRF is doing to save sight for millions of people, please feel free to contact Dawn Prall George, Executive Director, at 1-866-4MACULA or Dawn@mvrf.org and we will provide you with the latest information about the disease, cutting-edge research, novel treatments and prevention. Below we have provided our standard approved PR blurb to be used in all publications citing MVRF. Thank you! The Macula Vision Research Foundation (MVRF) is a 501(c)(3) organization dedicated to finding a cure for macular degeneration and other retinal diseases. To reach this goal, MVRF funds groundbreaking research projects conducted by the world’s top scientists with the hope of improving the lives of millions of people affected by visual impairment. What makes MVRF unique is that 100% of every dollar donated goes directly to research. All administrative and fundraising expenses are underwritten by the Karen and Herb Lotman Foundation, allowing MVRF to allocate all donations towards finding a cure. Along with funding research, MVRF also provides education and outreach to those with visual impairments through our SupportSightSM Program which consists of three main areas of focus: SupportSightSM Seminars, SupportSightNEWSSM and SupportSightSM Resources.